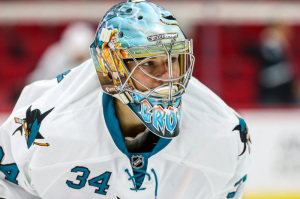 The San Jose Sharks have re-signed RFA goaltender Troy Grosenick, who made his NHL debut in the 2014-15 season. The deal, confirmed by Kevin Kurz of CSN Bay Area, is a two-year deal that is two-way in the first year and one-way in the second year, paying out $1.2 million at the NHL level. For the Sharks to give Grosenick a one-way deal in the second year speaks to confidence in the 26-year-old being able to compete with Alex Stalock for a job at the NHL level soon. Or maybe it’s confidence that they don’t believe Stalock will be with the organization. It’s an uncertain world in net for the Sharks right now with Antti Niemi likely to become a free agent on July 1 and Stalock not proving he was ready for the spotlight last season. They’ll need to find a starting solution for this season, which may involve a trade for someone like Cam Talbot, Eddie Lack, or Jacob Markstrom. At a minimum, Grosenick gives them a solid option at the AHL level, where he had success last year before suffering a concussion. He went 20-13-3 with a .906 save percentage in 36 games for AHL Worcester last season.